Authorities in Arizona announced on Friday the seizure of two massive truckloads of marijuana and methamphetamine worth $2 million and the arrests of three suspects in the case. The Maricopa County Sheriff’s Office said on Wednesday night detectives saw two trucks avoid a U.S. Border Patrol checkpoint near Gila Bend, about an hour southwest of Phoenix, and drive into the desert with their lights off. Spike strips were placed on the ground ahead of the trucks, which blew out its tires and forced it to a stop. Four people then got out and ran from the two trucks in an attempt to evade police, the sheriff’s office said. Three of those four men were eventually captured. From left to right, Jose Jaime Garcia-Lopez, Yoni Ontiveros-Torres and Ruben Espericueta-Jiminez were charged with possession over $2 million in marijuana and methamphetamine after being arrested near Gila Bend, Ariz., on Wednesday, Jan. 31, 2019. When the two abandoned trucks were inspected, police found 3,500 pounds of marijuana and over 220 pounds of meth. Ruben Espericueta-Jiminez, 46, Jose Jaime Garcia-Lopez, 30, and Yoni Ontiveros-Torres, 48, were arrested and charged with possession and transportation of dangerous drugs for sale and possession and transportation of marijuana for sale. The fourth suspect remains at large. Officials also said the trucks the men were driving were stolen and the license plates were fake. All three men were charged with theft of a vehicle as well as the drug charges. 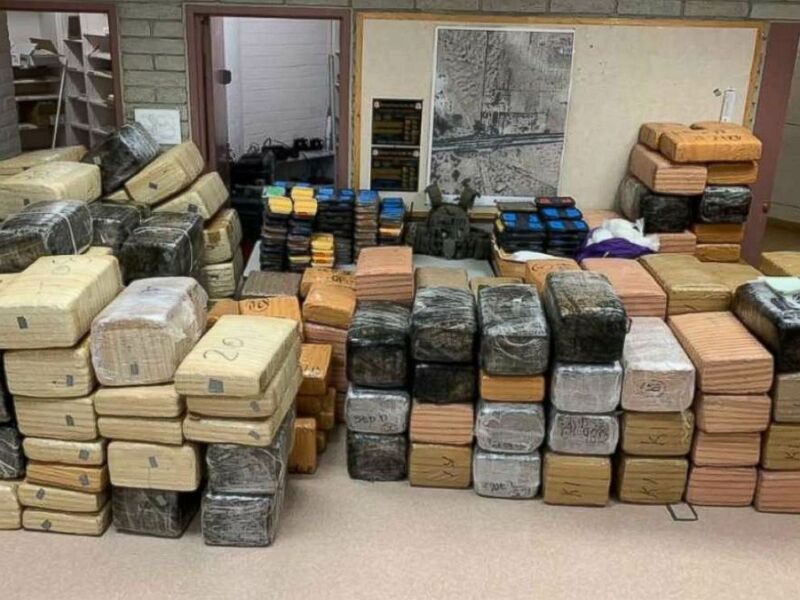 Authorities seized over 220 pounds of methamphetamine and 3,500 pounds of marijuana from two trucks near Gila Bend, Ariz., on Wednesday, Jan. 31, 2019. The seizure involved the Maricopa County Drug Suppression Task Force, including detectives from the sheriff’s office and agents from Customs and Border Protection. It was just last weekend that CBP made the largest fentanyl bust in U.S. history. Agents found about 250 pounds of fentanyl, a highly addictive opioid, at the Nogales Port of Entry, also in Arizona. Nogales is about three hours southeast of Gila Bend. Juan Antonio Torres-Barraza, who was allegedly also found in possession of about 400 pounds of meth, was charged with two counts of possession with intent to distribute.